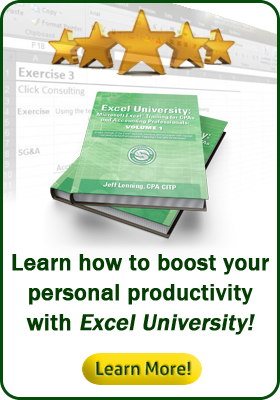 Excel University Masters 1 teaches Power Query, Power Pivot, and Power BI. It demonstrates how to use these powerful tools to build the process that builds our reports (tables and graphs). We select the report and graph type based on Stephen Few's book, Show Me the Numbers. Plus, we incorporate his design practices to ensure effective communication. This course uses case studies to simulate real-world workbooks and projects. The final case study brings everything together as we build a dashboard to monitor our business. We complete each case study in both Excel and Power BI. There is also a library of Excel workbooks with reference charts. Check out the first video from the course below to learn more. Presented with Excel O365 and Power BI for Windows. Notes: Excel for Windows O365 is the recommended version for taking this course, however, these tools are also available for legacy versions of Excel starting with Excel for Windows (2010+). Excel for Mac is not supported. Ensure you have access to Excel for Windows (version 2010 or later), so that you can work through the homework exercises. Plus, you'll want to download Power BI desktop (free) if you want to work on the Power BI exercises. Excel for Mac is not officially supported. This course does not qualify under NASBA standards for continuing education (CPE) credit and should not be claimed as such. Program enrollment is valid for one year.